Working in a workshop shaping different components from sawn stone. Using templates and drawings as a guide to produce carved stone for new and existing buildings to given specifications. Banker masons may also carry out intricate carvings. Experienced Stonemasons can complete an apprentice type programme in heritage and conservation crafts. 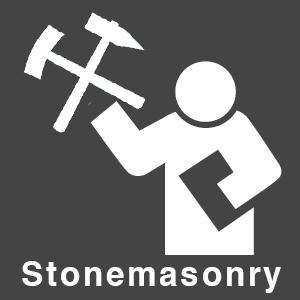 Conserving or restoring stonemasonry, setting out, erecting and repairing complex stonemasonry.